Taxidermists are artists of sorts that prepare skins of birds, mammals, reptiles and fish to create lifelike 3-D representations for display in museums, or as trophies and memorials. One of the most important aspects of the taxidermist’s job is to ensure that the client decides upon a position that they want the animal preserved in, as this will be important in the overall preparation. Taxidermists may perform the following tasks: take measurements and note features of specimens before mounting; reproduce specimens by moulding and casting with a variety of materials including plaster, polymers, plastic, fibreglass and polyurethane foam; remove and clean skin and treat with preservatives; preserve and prepare skeletons through the use of chemical and non-chemical treatment; collect and preserve foreground material for creating natural environments for diorama displays; maintain exhibits and specimens; advertise products and work; attend craft shows to market products; develop product packaging, display and pricing strategies. What is taxidermy? The art of restoring and preserving animals to look as lifelike as possible. Taxidermists utilise specific techniques to preserve the skin and hair and to recreate anatomically correct moulds on which to mount the skin. Typically work is done for: museums, national parks, game parks and aquariums for educational purposes; scientific study; various private educational facilities; trophy hunters for personal memories; restaurants and décor houses for interior decorating. Why did you choose to become a taxidermist? Because it is artistic in a natural way. No day is ever the same. There are always new challenges. Clients often stretch your capacity. You can be self-employed. You can start out small and grow big. What training did you undergo? I apprenticed for four months and then a friend came out from the USA and trained me further. Thereafter, it is up to the individual to become more skilled through self-learning. What type of personality is best suited to this job? Hard workers – taxidermy is not for the lazy. You need to be able to plan well and you must be able to work well with staff. Describe a typical day on the job Organise the staff for the day; set targets to achieve for the day / week; receive trophies from clients and book in the jobs; prepare moulds; prepare skin for putting on the mould; put skin on the mould and finish off the finer details such as the eyes and mouth; airbrush some of the trophies that have been drying for a while and make the trophy ready for the customer to collect. Is experience as important as formal training? Experience is more important than formal training as that’s what will make you successful. Formal training in taxidermy is there to instill the basic techniques. What do you enjoy the most? When clients make unusual and challenging requests that require you to apply your mind. Which aspects are you least keen on? Some clients don’t like to wait for their trophies and get a little difficult. Money is not all that good unless you go real big. Has there been a highlight of your career to date? Being requested to do a sculpture for a client and then having it cast in bronze. Share one of your future goals To do more sculpturing and to specialise in complex dioramas. Any advice for someone just starting out? Don’t start unless you are prepared to work hard, and have the physical strength to do the work. Attend a good school of taxidermy first and then apprentice at one of the top taxidermists for at least three years before venturing out on your own. Describe your job in three words Rewarding hard work. 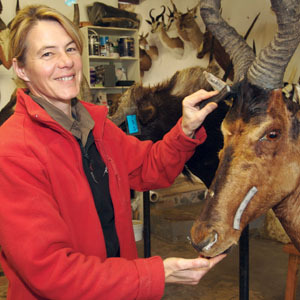 Though there is no set educational requirement for taxidermists in South Africa, many in this field hold a degree or diploma in relevant subjects such as museology, conservation techniques, display and design, museum chemistry, sculpture and photography. The most important aspect of the educational part of the job for prospective taxidermists is to have classes in taxidermy in order to know the proper way to handle this profession. Prospective taxidermists can learn the skill through in-service training under the supervision of an experienced taxidermist or follow a self-study programme, with the assistance of books. Taxidermists are encouraged to join the Taxidermy Association of Southern Africa.